Nigeria’s electoral commission began releasing the results of its Saturday presidential election on Monday, as delays triggered by protests, Boko Haram attacks, and faulty election technology marred an election already postponed by Islamist violence. The BBC is reporting that government officials have begun announcing results, with many fearing that voters will erupt in violence should their candidates lose. Results so far suggest a tight race between President Goodluck Jonathan of the People’s Democratic Party (PDP)—a Christian leader from the south of the country—and his rival, All Progressives Congress leader Muhammadu Buhari, a Muslim leader from the nation’s north who previously ran the country following a military coup. Nigeria’s Vanguard newspaper is reporting that many states have already announced the results of the presidential election. Buhari seems to be in the lead of a close race. At the forefront of the election is the growing violence in Nigeria’s northeast thanks to the presence of the jihadist terror group Boko Haram. Boko Haram has extremely little support in Nigeria. A Pew Research Center poll found that 82 percent of Nigerians hold an “unfavorable” view, while 79 percent hold a “very unfavorable” view of Boko Haram, and there was little meaningful difference in that lack of support between Christian and Muslim Nigerians. Boko Haram attacks had postponed the presidential election, initially scheduled for February. The group staged attacks during this election, as well, having vowed to prevent it from happening at all. Boko Haram killed 41 people—including a Nigerian legislator—on Saturday, as well as killing two in an attack on Sunday in northern Bauchi state. It is believed that the attacks did suppress the vote in the north, and Bauchi’s governor imposed a 24-curfew on all residents of the state after the attacks. The APC had alleged that election results could not be trusted, though not because of Boko Haram interference. 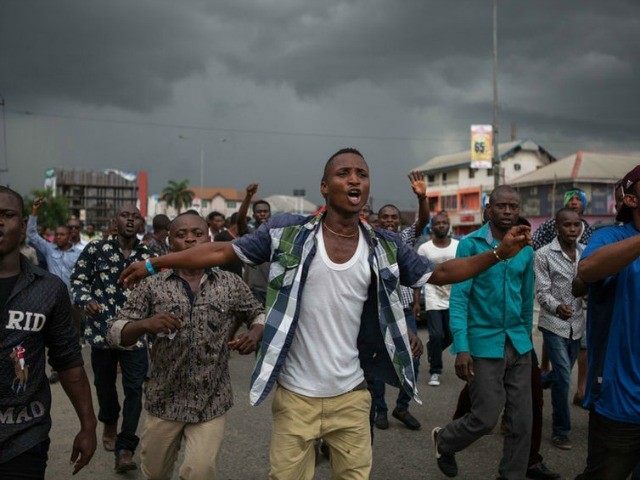 The state experiencing the most violence unrelated to Boko Haram attacks was southern Rivers state, in which authorities fired tear gas at a violent crowd officials allege were trying to tamper with the election results. The crowd is believed to have been supporting the APC, and the party is calling that state’s results “a sham and a charade,” Reuters reports. Police told Reuters that the crowd’s “intention was to destroy INEC [election commission] materials,” while APC spokesmen allege that the suppression of these voters renders the election void. The African news outlet RFI shines some more light on the Rivers state situation: protesters were allegedly also demanding functional card readers—new technology in Nigerian elections—and other voting materials. RFI adds that, in addition to Bauchi State, Boko Haram struck the more northern Gombe state. While the United Nations and African Union celebrated the relative lack of violence in this round of elections, United Kingdom and United States officials issued a joint statement this morning warning of signs of “deliberate political interference” in the elections, stating that both nations were “very concerned” that the results of the election would be unfair. Other, smaller incidents of violence have been reported by local media, including the murder of a man by his pregnant wife, allegedly over a dispute regarding which party to vote for. Nigerian law stipulates that, should the election between Jonathan and Buhari be too close to call, the nation must hold a runoff vote eliminating the less popular presidential candidates. Full election results are expected by Tuesday.